As a carpenter, you know how the business goes. When it rains it pours; and in between you may be wondering where all the work has gone. That’s why it’s important to always keep an eye on growing your carpenter business. You want a steady pipeline of work – customers who are coming to you, and preferably people who are coming back. So what can you do to move towards that goal, besides making sure you have solid carpenters insurance that gives you the confidence to focus on your business? There are many ways to advance your business, but we’ve come up with 8 easy tips to help your carpentry business grow. It’s not necessarily going to draw tons of business, but it’s always good to have a Facebook page if you want to grow your carpenter business. Once you create a Facebook page for your business, you can send out a notification to friends to start boosting your popularity, ask customers to ‘Like’ you, and even request reviews. You can also advertise on Facebook if you have the budget. Make sure to properly geo target the ads, and select your banner text carefully, so that it includes your specialty, and of course, your contact details. Not everything is online these days. A cute magnet with your contact details can go a long way. Always make sure to leave a few behind when you finish a job, so customers can pin you up on the fridge, and more likely remember you. Vistaprint offers some great options that fit within a variety of budgets. Life is getting more visual these days, and Instagram is more popular than ever. So set up an account and post pictures of projects there, as often as you can. It’s a really great way to show what you can do, in a really accessible way. Post pictures while on the job. People will love seeing how you get the job done, the efficiency of your work, your attention to detail, and of course, how you clean up after. Once you’ve completed a project, post away from every angle. After all, a big part of your business is the finished product, and this is one of the most effective ways to show it. As a carpenter, you have a wide world of opportunities. Right now, you likely operate in a niche market you’ve carved out for yourself. Are you mostly doing bathrooms, kitchens, cabinets, small jobs, or major overhauls? There are two ways to approach this when growing your carpenter business. You can either better define your niche, differentiating yourself as an expert in your field, so that customers know, for example that you’re the “go to guy” for all bathroom renovations. Or you can expand your services, so people know you’re a jack of all trades, i.e. that you do all sorts of carpentry work. Customer acquisition is far more difficult (and costly!) than customer retention. Once a customer has used your services, if they were satisfied, they’ll likely do so again. Of course, most people aren’t re-doing their homes on an annual basis. But they could need work on their fence one year, add new door frames the following year, and do some work on their stairs the year after that. Knowing this, you can reach out to customers say once a season, and remind them of the types of jobs you’re doing. For example things like rafters, rooftops and fences are generally great business ideas for the spring. You can also offer a discount for referrals–a free tablet or dinner for two if someone sends you a full house renovation, a gift certificate for any friend who they refer or even just a heartfelt thank you note are all reasons for customers to refer you to their friends and family. While you’re likely a master of your trade, with excellent skills and the reputation to match, there’s always room to learn. So, when growing your carpenter business, you may want to explore professional carpenter courses. Options include technical trade schools, carpentry colleges and all sorts of certification programs. These are great for building your credentials. 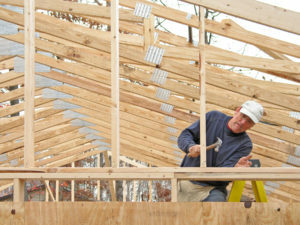 Or if you simply want to improve your skills, or venture into a new area of carpentry, you can take a specialized class. If you’re finding yourself bogged down in paperwork, or spending too much time on the job fielding calls from potential customers, it might be time to hire a secretary or office manager. Having someone handle logistics is an excellent way to free up your time, so you can focus on the hands-on work. And if you’re really dedicated to growing your carpenter business, you may want to hire another pair of hands – so when the business comes pouring in, you’ll be able to handle it.